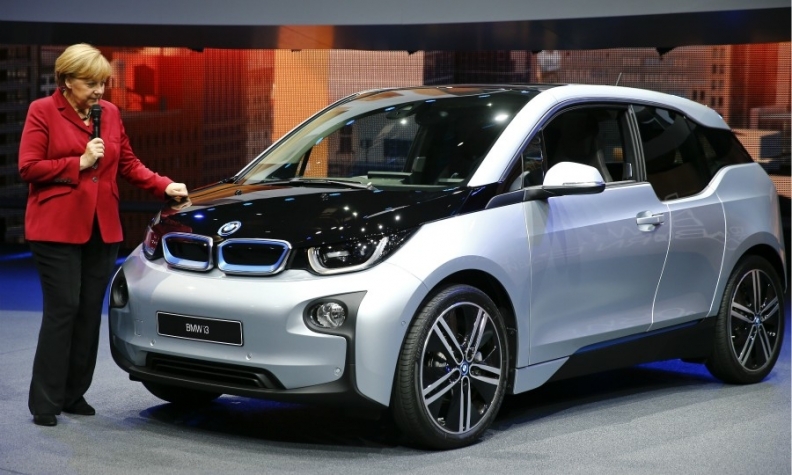 Merkel, pictured with a BMW i3 at the 2015 Frankfurt auto show, is a staunch supporter of the German auto industry. BERLIN -- German Chancellor Angela Merkel, a fierce defender of the country's powerful auto industry, appeared to accept the days of the combustion engine may be numbered, as she hit out at carmakers accused of cheating diesel-emissions tests. In an interview with the Wirtschaftswoche magazine published on Thursday, Merkel did not give a clear commitment to the diesel technology that her government has promoted to help cut carbon dioxide emissions and fight climate change. "What is important is that the newest and best technology is used," she was quoted as saying. "We are in a transformation phase away from the combustion engine." Merkel, who has been criticized by environmental and consumer groups for defending the diesel industry since the VW scandal, hit out at manufacturers that cheat emissions tests. "There is nothing that can justify the fraudulent methods used to limit test values in the diesel area of some manufacturers that has damaged the whole diesel business," she said. "For many years, we have appreciated diesel because it helped save fuel and CO2," she said, adding some things had to be re-evaluated. Merkel's comments - almost two years after the Volkswagen Group emissions scandal broke - come as her government faces growing pressure ahead of national elections on Sept. 24 to reduce diesel pollution or see cities impose driving bans. Sales of diesel cars have been falling since the VW scandal, but have dropped faster since cities, including Stuttgart and Munich, have considered banning some diesel vehicles, blaming emissions for a rise in respiratory disease. On Tuesday, German ministers announced they would establish a national "diesel forum" to find ways to cut pollution and set up a new organization to test vehicles. On Wednesday, German carmakers BMW, Audi and truck manufacturer MAN agreed with the regional government in Bavaria to cut nitrogen oxide (NOx) emissions from diesel engines, a likely precursor to the national plan. Foreign carmakers have not yet committed to cutting emissions but will likely do so by the Aug. 2 meeting of the government's "diesel forum," the German auto importers' association VDIK said on Thursday. Germany's ADAC car club, Europe's largest and most influential, has warned consumers to push back planned purchases of diesel cars until cleaner Euro-6D technology becomes available in new models this autumn. Merkel said how fast the shift away from combustion engines took place had to be negotiated, with efficient combustion engines likely to still have a long future, perhaps combined with electric motors in hybrid cars. Last month, she admitted Germany was likely to miss the government's target of bringing 1 million electric cars onto the roads by the end of the decade, but added the breakthrough could come very abruptly, as with the smartphone.